There are a lot of visitors to my garden, birds, cats, bees, caterpillars, butterflies, even the odd frog. They’re all welcome, of course, the buzzing of bees busy among the flowers or the queue of birds on the fence waiting their turn at the feeder; the fluttering of butterflies over the shrubs or the staccato flight of hover-flies looking for pollen to eat. They make the garden feel alive and there’s a great sense of satisfaction and well-being in knowing that you’ve created a rich and thriving pocket that’s visited daily by countless things. 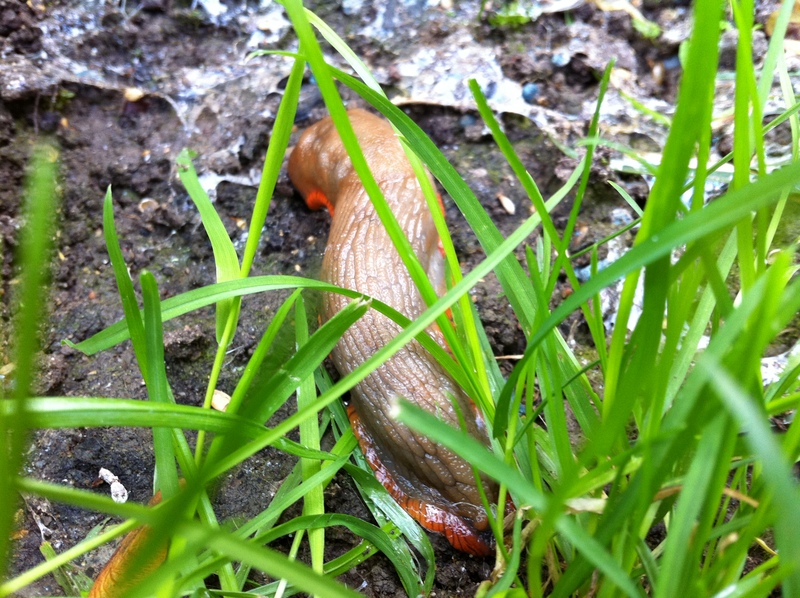 There are also slugs and snails. These are less welcome, they raze new green shoots to the ground, decimate seedlings, shred foliage, leave horrible slime and ooze on great winding tracks across soil, plants and grass. They are not welcome. In the spring I mulched with slug pellets, I turned the borders blue with many cans of the stuff and it did work, it got rid of virtually all the slugs and snails overnight and I’ve not spotted since and so not had to put any more slug killer down…until now. I’m learning when their season for appearing is and Autumn – along with Spring – seems to be one of them. I’ve noticed collections of slugs in certain areas in the borders and also tiny little snails dotted around, crawling over plants, leaving holes in the leaves. It’s time to reach for the blue pellets once more.